Homeless individuals can join day-labor crews cleaning streets and medians for cash as part of a partnership with Pima County, the City of Tucson and several nonprofit agencies that began Dec. 6. The effort will provide work opportunities to homeless persons and connect them with services to move them out of homelessness. Program participants seeking full-time work can get employability skills training through the county’s Sullivan Jackson Employment Center, said Director Daniel Sullivan. "We stand ready to provide services for program participants who wish to transition to full-time work by offering them placement in our Job Offer Academy, which is an employability skills program designed around the needs of people experiencing homelessness seeking employment," Sullivan said. Workers will be picked up twice a week: on Tuesdays from Primavera Men’s Shelter, 200 E. Benson Hwy., and on Thursdays from the Salvation Army Hospitality House, 1002 N. Main Ave. The van transporting workers also will have a trailer providing a portable bathroom and tool storage. District 3 Supervisor Sharon Bronson, chair of the Pima County Board of Supervisors, and Ward 5 City Councilmember Richard Fimbres are leading the effort. City of Tucson and Pima County each are contributing $25,000 to start the effort. The facilities staff and engagement specialist will go to the pickup location and select six persons who are able and willing to work for five hours. Staff will provide workers with a sack lunch, water, gloves, hat, sunscreen, and an orange safety vest. Facilities staff and the engagement specialist will transport workers to the work site and supervise them. At the conclusion of the work, staff will transport workers back to the Old Pueblo Community Services Administration Office for cash payment of $9/hour. At the end of the workday, staff will take workers to a site where they will have access to showers, clothing, a haircut, and a hot meal. During this time the engagement specialist will ask the workers to complete an assessment regarding their personal circumstances, give them information about available housing and support services, enroll them in AHCCCS, and schedule them for an intake appointment with a behavioral health provider. The Tucson Change Movement will provide funding past the pilot stage of the project. Tucson Change Movement is a merchant-driven initiative to raise funds for homeless programs and services based on similar models in Denver and Los Angeles. 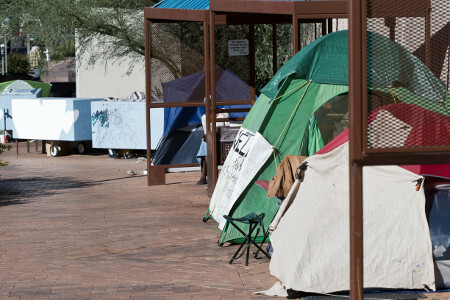 The Tucson Homeless Work Program is based upon a similar program launched in Albuquerque, N.M. Both programs will be operated outside of government to give them maximum flexibility to achieve goals of their respective missions. The Tucson Change Movement designated as their flagship program to fund, the Tucson Homeless Work Program. Tom Litwicki, CEO of Old Pueblo Community Services, praised the multi-agency participation to get the project off the ground.